” The truth is that mental health is enormously costly, in every respect. It’s costly for individuals who suffer, its costly to their families but it’s especially costly when people take their own lives. So we all have a vested interest in each others’ mental health. The most important thing we can do is to look out for each other. Yes, governments and parliaments and health professionals spend money and trial new approaches and use digital technologies more effectively and we’re doing all these things and we’ll no doubt do much more in the future. But you know, just four letters ‘R U OK?’ can make a difference. Because they represent another four letters, ‘L O V E’ – love. That’s what it’s about; showing that love and care for the people with whom you are with, whether they are your families, your friends or your workmates. Reach out to them, ask are you okay, show you care. You could not just change a life, you could save a life. ” We know that suicide is the scourge of rural and regional communities. It takes a shocking toll on our people in the bush. We know the suicide rate is twice as high amongst our First Australians, Pat Dodson has written movingly about those nights when his phone rings with the tragic news that another young person in the Kimberley has taken their life. There is always time to start a conversation. I think about all the people that I have known – and I am not sure I could have done anything then to change something. When Bill Shorten sat down to prepare some remarks for a parliamentary breakfast on suicide, he reflected on how many people he knew who had taken their own life. He stopped at about seven. “The thing about these people I thought about is that they remain forever young,” the opposition leader told an ‘R U Ok?’ gathering at Parliament House in Canberra on Tuesday. Mr Shorten said he questioned what he could have done to help them or whether people didn’t see a sign. He’s not alone. 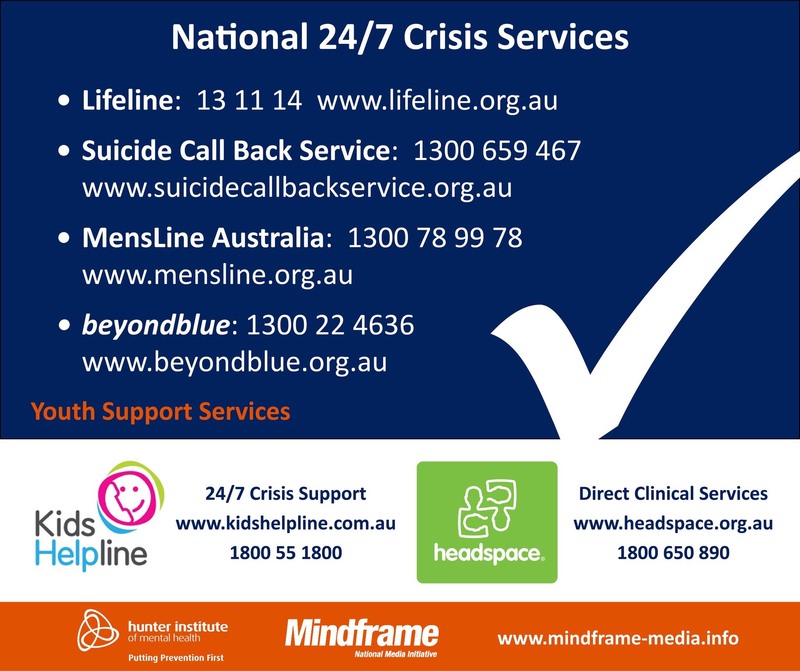 Seven people commit suicide on average every day in Australia. “It is a silent crisis at the heart of our nation,” he said. Mr Shorten reflected on veterans who feel let down by the nation they served and young people who feel like they don’t fit in. The world of social media had created a form of emotional distance, a world of exotic holidays and glamorous events, he noted. Mr Shorten believes MPs and senators are actually well placed to understand the message of the suicide prevention charity. Prime Minister Malcolm Turnbull said suicide prevention was about people but the high statistics demand everyone do much better. He believes a reluctance to talk about mental health issues – whether because of stigma or taboo – has been a barrier. “You can’t deal with a problem that you don’t acknowledge,” he said. Mr Turnbull noted the work of the late Watson’s Bay resident Don Ritchie who invited anxious people at The Gap nearby in for a chat and a cuppa. “He would gently lure them back from the brink by doing no more than showing that he cared for them,” he said. Mr Shorten was glad the event brought the two leaders together. “It’s a galling thing when you’re leader of the opposition and the prime minister yells slogans at you,” he said. Both agreed the mutual feeling would be over by question time. Well good morning. It’s great to be here with Andrew Wallace who is standing in for Julian Leeser, who together with Mike Kelly are Co-Chairs of the Friendship Group. 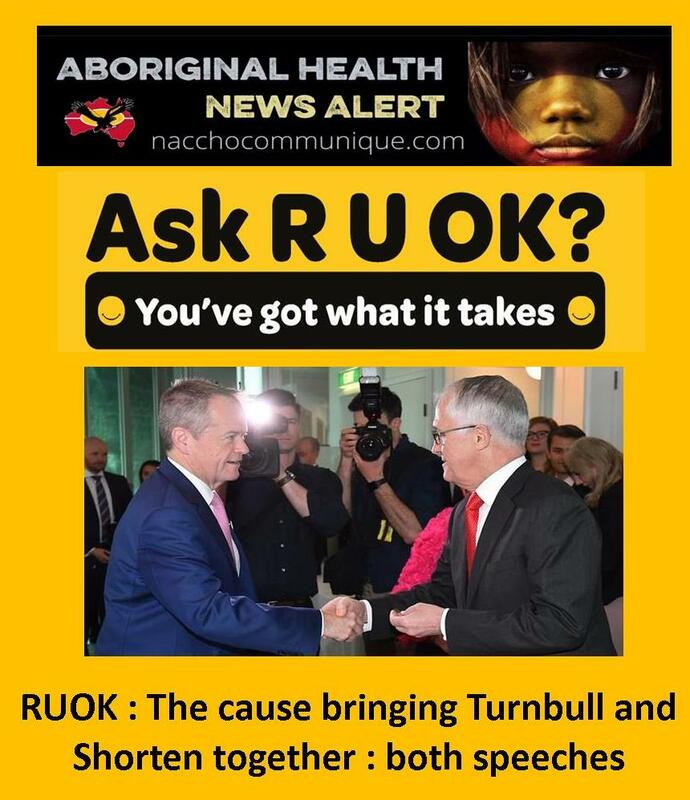 I acknowledge Greg Hunt, the Minister for Health and Sport, Bill Shorten, Julie Collins the Shadow Minister for Ageing and Mental Health, Murray Bleach, the Chairman Suicide Prevention Australia, Mike Connaghan – Chairman of RUOK? and Mike and I were reflecting on how many decades it is since we first met and worked together in advertising but there it is. You’re looking very youthful. That’s what happens if you don’t go into politics. And of course Professor Batterham is our guest speaker this morning – and so many other leaders in health and in suicide prevention, and of course all my Parliamentary colleagues here as well. Now we’re all united here behind Suicide Prevention Day and R U OK? Day. Suicide Prevention Day was on Sunday and R U OK? Day is later this week. Each year, around one in every five Australians experience mental illness and in 2015, more than 3,000 took their own life. Now, suicide is about people, it’s about families, not numbers. But the statistics confront us all and call on us to do much better. I am firmly of the view that our reluctance to talk about mental health issues – whether you call it a stigma or a taboo – has been a very real barrier to addressing this issue. You can’t deal with a problem that you do not acknowledge. So we have started to talk about suicide and mental health and in an open and honest way, as we have not done in the past. Now my own electorate of Wentworth includes one of the most beautiful yet tragic places in Australia, The Gap. It is a place where many, many Australians take their lives. A part of The Gap story until he died in 2012 was an extraordinary man called Don Ritchie who was an old sailor and also very tall, I might add. For the best part of half a century, he lived near The Gap and when he would go for walks and he saw somebody there – anxious, perhaps standing on the wrong side of the fence – he would talk to them. He would say: “Are you OK? How are you going? Do you want to have a chat? Do you want to come in and have a cup of tea?” He would gently lure them back from the brink by doing no more than showing that he cared for them. That is why ‘R U OK? Day?’ is so important. Because what it is all about, is showing that we do care. Four letters ‘R U O K’ import so much. They send a message of love, they send a message of care. Critically important and what could be more Australian than looking out for your mates? Or looking out for people you don’t even know? Looking out for somebody who seems anxious, worried, or someone at work that isn’t quite themselves. It is a caring and a loving question. And it raises very prominently this issue of awareness, to the forefront. At Gap Park for example, as the local Member, I’ve pushed for more funding and support for suicide prevention. Since 2010 there has been implemented a ‘Gap Master Plan’ and I want to acknowledge the support that Julia Gillard provided as Prime Minister to support the local government, the Woollahra Council, towards that funding. It was a series of measures of signs, telephones, obviously of cameras so that the police can keep an eye on what’s going on there and also a very innovative design in defences that are hard to get over, but easier to get back over, if you know what I mean. So all of this makes a difference and since 2010 the local police tell me there has been a significant increase in the number of successful interventions at The Gap. But still, far, far too many people die there and in many other places around Australia. Now, we’re working better to understand the factors that have contributed to rising suicide rates and to support communities to respond to their own unique circumstances. We’re committed to reducing suicide rates through regional trials, research and building the evidence base with flexible models that address regional needs and work in our local communities. This includes the implementation of 12 regional suicide prevention trial sites in Townsville, the Kimberley and Darwin and other places. Digital innovation trials and ten lead sites to trial different care models. All looking to see what actually works. We’re also investing a great deal more in mental health and making services more effective, accessible and tailored to local needs. Since 2016, we’ve invested an additional $367.5 million in mental health and suicide prevention support. That includes a $194.5 million election package towards building a modern 21st century mental health system and our $173 million in new funding in the 2017‑18 Budget and $58.6 million to expand mental health and suicide prevention services for current and ex-serving ADF members and their families. So we’re putting existing resources to work. But you know, the most important resource is you, is all of us. You know my very good friend and a good friend of all of yours, I know, Ian Hickie has got a great concept. He talks about the ‘mental wealth of nations’, sort of elaborating from Adam Smith. The truth is that mental health is enormously costly, in every respect. But you know, just four letters ‘R U OK?’ can make a difference. Because they represent another four letters, ‘L O V E’ – love. That’s what it’s about; showing that love and care for the people with whom you are with, whether they are your families, your friends or your workmates. Reach out to them, ask are you okay, show you care. You could not just change a life, you could save a life. I’d like to acknowledge the traditional owners of this land, I pay my respect to their elders both past and present. I’m actually going to spend a moment on what the Prime Minister said and thank him for his words. It’s a galling thing when you’re Leader of the Opposition that the Prime Minister yells slogans at you one day, and you think oh why did he do that? But then occasionally he gives a speech like that and I think, you’re not too bad after all. It really was a good set of words. Mind you, by Question Time that thought will be erased. I’d like to thank Mike Kelly and Andrew Wallace filling in for Julian Leeser for bringing all of us here today. We’ve got the Shadow Minister Julie Collins and we’ve got the Minister Greg Hunt. Yesterday afternoon when I was preparing my words for this morning, I stopped to think about people I’d known who’d taken their own lives. And you start to construct that list. I’m sure I’m not unique. I think most Australians find out after the event, someone they liked or loved has taken their own life. As I got thinking about it, I could think of about seven people I knew. I actually stopped there. Because I knew the longer I thought, I could think of families with their kids and other people. The thing about these people I thought about, is that they remain forever young. You can still imagine them. You can remember not everything that you should, but you can remember some of their jokes perhaps, some of their ideas, some of their abilities. I think about RUOK and I thought what could we have done then, what could I have done then? And what has been done today to help this be prevented in the future. I think about each of these people, and I went through the process of writing down their names just to start reconstructing. Because you don’t always think about the people who have passed, you move on, the events move on. And I think, was there some sign that they weren’t well? Was there some signal, some marker? Is there something you could have done differently? Some of the people I think of were teenagers, highly-talented. They seemed to be very successful at everything they did. But inside they were battling illness and great, great depression. And when I thought about seven people I could think of I was reminded that seven Australians take their life on average every day, and possibly seven more will today. Every single day. It is a silent crisis at the heart of our nation. I’m sure all of you have sat with parents at their table when they’re numb with incomprehension, when they’re shattered by grief. When they’re trying to write words to say farewell to their child or their adult child, taken too soon. I still recall a school assembly where the school captain or someone very senior in the school said he died on a train, that’s what we were told. It was only years after that I found out that was the way the school dealt with the fact that he had taken his own life. And you do think about what you could have done. I think about veterans who are let down by the nation that they served. Seven Australians – every day. And what I wanted to say is that these are preventable deaths – we are not talking about a terminal condition, some dreadful metastasising cancer spread throughout a human body. These deaths are preventable, there is nothing inevitable about suicide. And we know that expert assistance can make the difference but it is in short supply. Our emergency departments work very well. If you turn up with say chest pains, terrible chest pains I reckon nearly all of the time you’ll get the right diagnosis and the care is there. When I was talking to Professor Pat McGorry who is here today, you know and he worries that you can turn up to an emergency department and you’ve got a very serious case of potential self-harm, or as a suicide risk. Do we have the resources there to the same proportion as a medical condition, another medical condition? I don’t think we do. And I know every Member of Parliament here regardless of their political affiliation will have constituents who come to them desperate, red-eyed saying I’ve got a child, an adult child who really needs that sub-acute care. And the search for the beds that aren’t there. We know that suicide is the scourge of rural and regional communities. We know, as Mike Kelly alluded to, that suicide is more common and more frequently attempted by young LGBTI Australians grappling with their sexuality, fearing rejection. Completely alienated and unsure of where they fit in. And we all do have a responsibility to call-out that hateful discrimination and language, particularly in the weeks ahead. The simple truth is no part of our nation has a wall tall enough to keep the scourge of suicide from that postcode. Suicide is no respecter of ethnicity, of income. It does not care which god you pray to, or who you love, it affects every Australian and therefore it is within the power of every Australian to do something about it. We live in a world where it has been easier than ever to see what our friends and our family are up to. I remember when I was a backpacker 25 years ago, I could be back home before any of the postcards which I had sent to Mum and Dad. These days you feel like you’re on everybody else’s holiday half the time, as soon as you turn on the computer. Australians aged between 15 and 24 spend an average of around 18 hours a week online. Facebook and Snapchat also create emotional distance. A carefully-curated view of each other’s lives: exotic holidays, glamorous events, fun nights out, fancy meals. We have now got a situation where before teenagers will eat the food, they will photograph it. But the challenge for us is to look beyond the superficial snapshots of endless good times, to go further than simply clicking ‘like’ and scrolling on down the feed. It’s about digging a bit deeper. And in conclusion, that’s why we are here. It’s time to make that call, to send a message, to drop-in for a visit – to really see how someone is going. 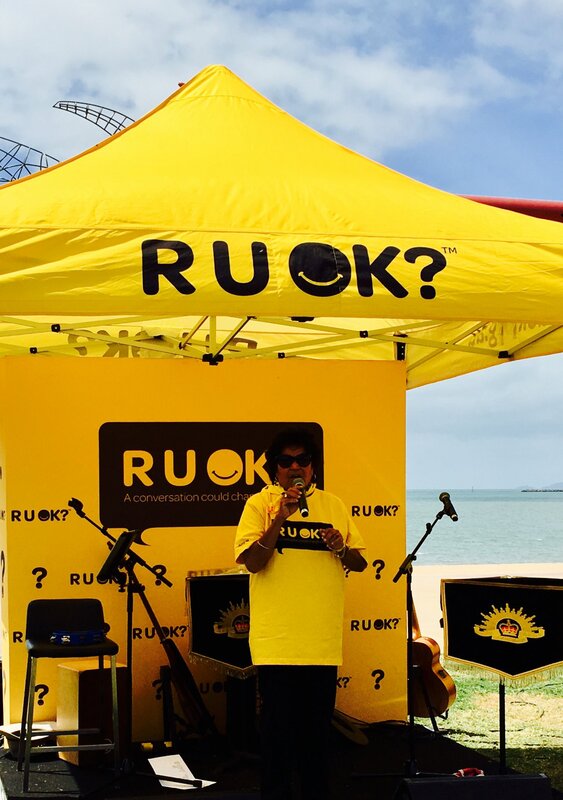 I actually think Parliamentarians are well placed to understand RUOK Day. We’ve all seen our own challenges with mental health, I think previously in this parliament. In this very large building with thousands of people, it can be hard and isolating experience. 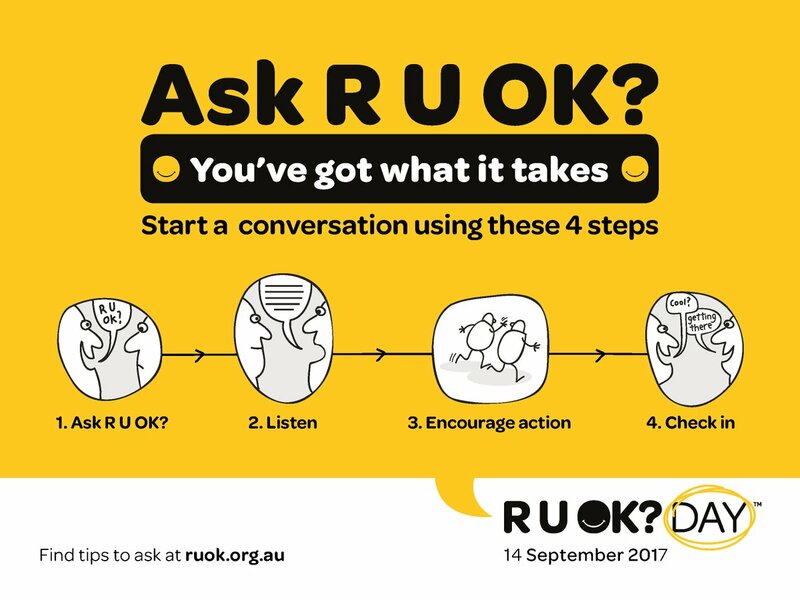 It is important that RUOK day occurs because it is a reminder that we need to distinguish and not let the urgent distract us from the important.